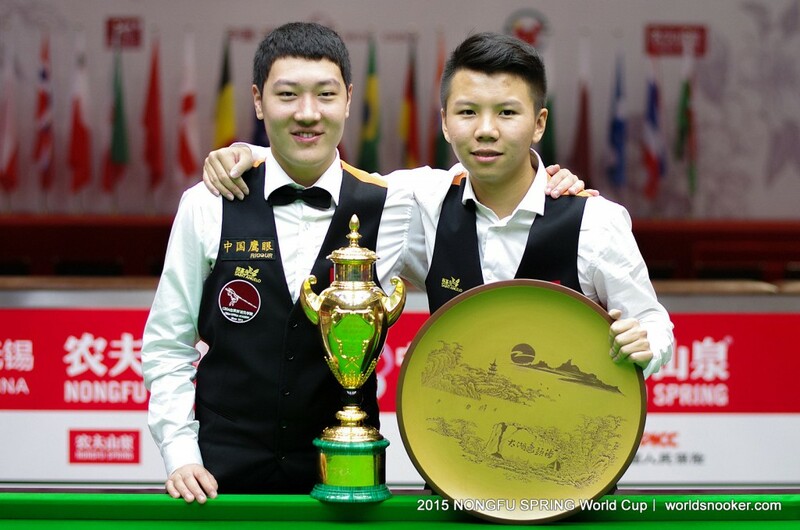 China B’s talented teenagers Zhou Yuelong and Yan Bingtao won the Nongfu Spring World Cup in their home country, beating Scotland 4-1 in the final in Wuxi. It’s the second consecutive time that China have won the event as they beat Northern Ireland in the final in Thailand in 2011. On that occasion it was Ding Junhui and Liang Wenbo who took the trophy. 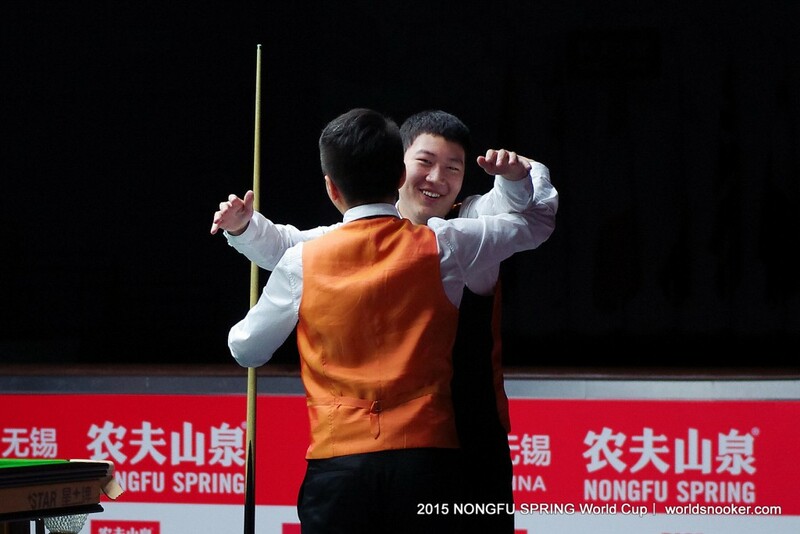 This time the host nation was allowed to enter two teams into the 24-team tournament, and it was their ‘B’ pairing of 17-year-old Zhou and 15-year-old Yan who stole the show with a series of brilliant displays. After coming through the group phase then knocking out Australia and Wales, they beat experienced Scottish duo John Higgins and Stephen Maguire in the final to claim the $200,000 top prize and underline China’s status as a growing force in the global game. Zhou and Yan have both won the World Amateur title and both look to have the potential to follow in Ding’s footsteps and become regular winners on the professional circuit. Zhou scored some impressive results during his rookie year on the tour last season, while Yan is now debuting on the circuit. As an added bonus, both players have earned a place in the Champion of Champions event in Coventry in November. China stormed into a 3-0 lead in the final as Yan beat Higgins in the opening frame with a break of 100, Zhou saw off Maguire with runs of 44 and 51, then the home favourites added a doubles frame. 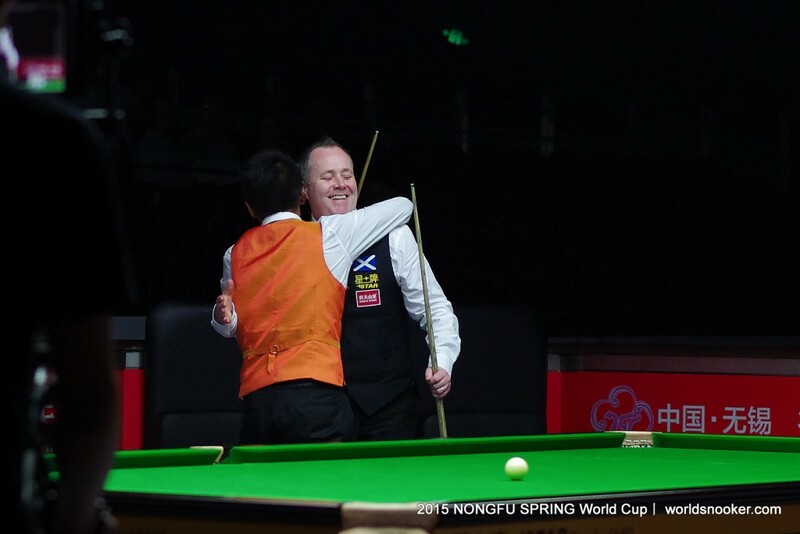 Maguire took frame four against Yan, but Zhou’s 33 clearance in frame five against Higgins gave China the title. Earlier in the semi-finals, Scotland beat India 4-3, with Maguire taking a dramatic final frame on the last pink after Aditya Mehta had missed a match-winning chance. China B edged out Welsh duo Mark Williams and Michael White 4-3. Zhou, who is based in Sheffield while he’s in the UK, said: “It’s unbelievable – fantastic. It’s a huge tournament for us. Our dreams were to become champions since we first picked up the cue – and now they have come true. It’s very unexpected. Our goal was to make the knock out stage because we were in a tough group. After the group stage we realised that we had a good chance if we could play our best, so the confidence just built match by match. “I believe John and Stephen felt surprised when we went 3-0 up. We encouraged each other to just focus on every shot, not to think about the outcome. Even if we had lost it would have been a great experience for us and given us a massive boost. “We have to thank the CBSA for giving us a chance to represent our country. We are so young so it’s a chance to experience high level competition. We made the most of it. Wuxi is a great city and we had a lot of support.